The name Edward Maunde Thompson has no resonance in Jamaican history, but a chance observation in a Daily Gleaner of August 1909 introduced me to this eminent Jamaican. At that time Sir Edward retired from his post as Principal Librarian and Director of the British Museum, and the Gleaner commented editorially on the purely accidental discovery that he was Jamaican. A few days later, in a letter to the paper, W. A. Feurtado, that well-known authority on matters of Jamaican genealogy, set out what he knew of Sir Edward's Jamaican background. His father was Edward Thompson, at one time the Custos of Clarendon and member of the Assembly for the same parish; his mother was Eliza Hayhurst Poole, daughter of Samuel Poole, of Ludlow Estate, Clarendon. According to Feurtado, Sir Edward's wife, Georgiana Susanna McKenzie, whom he married in 1864, was from an old Scots-Jamaican family; her earliest Jamaican ancestor was Sir Alexander McKenzie, who had settled in Jamaica after being involved in an expedition to Darien, presumably the ill-fated one in the late 1690s. The McKenzie family was linked in the 18th century with other prominent Jamaican families, especially the Gordons, Lynchs, Ramsays and Girods. Another correspondent, Louis Lindo, stated that Sir Edward's younger brother had later become the owner Seville Estate, near St Ann's Bay. Undoubtedly Sir Edward, born here in 1840, can be claimed for the island; I hope that someone, more knowledgeable than I, can confirm, or modify, this information about his background. I made it my business, however, in England this summer, to find out more about the career of this truly remarkable man. With very kind assistance from officials at the British Museum, especially from Christopher Date, Assistant Museum Archivist, who showed me Sir Edward's portrait in the Museum's board room, I obtained a very detailed picture of his role and significance in the Museum's history. According to Louis Lindo, who claimed to have travelled to England in 1842,on the same ship, the 'London', as Edward Thompson and his mother and her sister, the boy stayed in England and was sent to Rugby, where, according to a testimonial from Charles Evans, a master at the school and also a Fellow of Trinity College, Cambridge, he became a 'very sound and careful classical scholar' and 'well acquainted with French and German'. He had also already established his reputation for methodical and systematic hard work. He seemed set for a distinguished career at University College, Oxford, where he went in 1859, but his father's financial problems prevented him remaining there for even one year. He apparently returned to Jamaica, briefly, but in 1861 applied for a post as an assistant at the British Museum. Another testimonial at that time, which has not, apparently, survived, was from the Rev. Dr. Frederick Temple, then Head Master of Rugby School and later Archbishop of Canterbury. He obtained the Museum post and worked at first in the principal librarian's office, but was soon moved to the Department of Manuscripts, then headed by Sir Frederic Madden. It seems that Thompson was not, at this stage, entirely sure of his future career; in 1863 he entered the Middle Temple and was called to the bar in 1867. However, he never practised as a barrister. In 1866 he became assistant to (Sir) Edward Bond, who had just been made Keeper of the Manuscripts, and in 1871 he was made Assistant Keeper of the Manuscripts. He was now well embarked on a career which was to have enormous significance for the development of the British Museum far into the future. It is difficult in a brief survey to give a satisfactory assessment of Sir Edward Thompson's achievements. It is clear that these fell into two categories - the scholarly and the administrative, in both of which he excelled. He was not a man to indulge in self-advertisement, and his scholarly work was only well-known among a relatively small circle. Through his work in the Department of Manuscripts, of which he was made Keeper in 1878, he became increasingly acknowledged as an expert in the field of palaeography. He was deeply involved in the updating of the Library's catalogues of manuscripts, and went on to catalogue and edit an impressive list of classical, mediaeval and early modern manuscripts; he later became a foremost expert on the handwriting of Shakespeare. 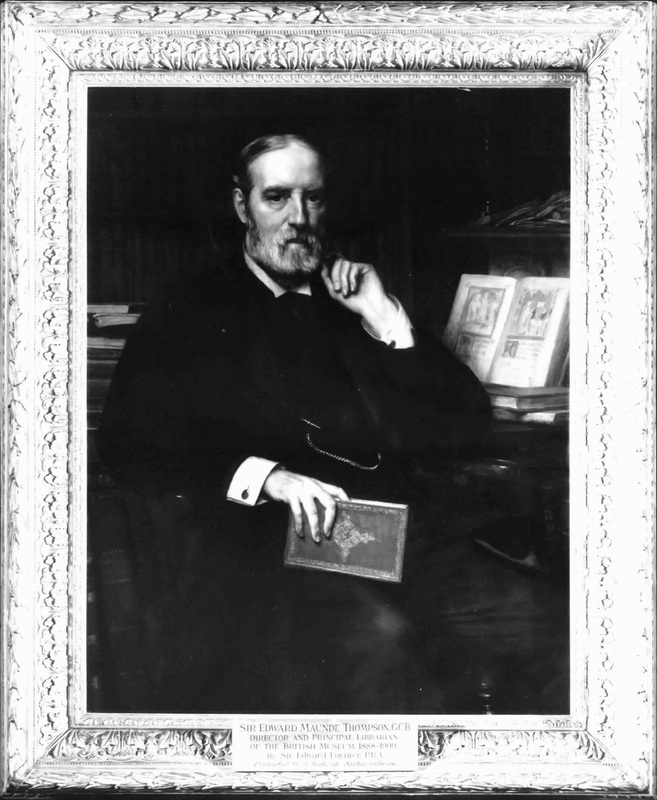 In 1873 he was a co-founder of the Palaeographical Society, which pioneered the production of photographic reproductions of manuscripts for the benefit of students and scholars. When he became Principal Librarian his scholarly work was reduced, but he took it up again after his retirement and continued with it almost until his death in 1929. In 1901 he was one of the founding members of the British Academy, and was its second president from 1907 to 1909. He received honorary degrees from Oxford, Durham, St. Andrews and Manchester universities, and gratifyingly was made an honorary fellow of University College, Oxford. His many articles and handbooks on palaeography stand as the record of his scholarship. And work till nearly four. In contrast, Sir Edward was a stickler for hard work and proper behaviour, and he expected the staff to devote themselves as wholeheartedly to the interests of the Library and Museum as he did himself. He insisted on observance of the established rule that senior staff wear top hats in all the public galleries, except the Reading Room [Round Room] where only the Superintendent was allowed to wear one; even Thompson removed his top hat when passing through that Room. He also continued to impose on the staff the prohibition of riding bicycles on the public streets. He reportedly froze permanently the salary of an attendant whom he found asleep at his post in one of the galleries; his more understanding successor, Kenyon, reversed this harsh decision. In fairness to Sir Edward, however, it must be said that he worked assiduously to have the pay scales of all levels of staff improved, and was largely responsible for increases of 6-11% for higher-paid staff, and 20-25% for the lower-paid. Although of somewhat intimidating appearance and demeanour, he was in fact capable of great kindness and assistance to members of his staff when genuinely needed. Thompson was very conscious of the obligation to make the Museum's holdings accessible to the public, and he continued and considerably expanded his predecessors' efforts in this respect. He improved and extended the exhibition and labelling of objects, and increased the number and quality of the guidebooks. He also revived and extended the Museum's archaeological undertakings in the Middle East and other parts of Asia. The need for more space was pressing, and Thompson was largely responsible for the very significant acquisition, in 1895, of property around the existing Museum buildings. He was also deeply involved in the campaign in 1900 to prevent the passing of a bill through Parliament, which would have obliged the Museum to dispose of, or even destroy, certain classes of materials, especially provincial newspapers. The problem of the need for more space was then tackled by starting in 1907 on the construction of new galleries, named after Edward VII, who laid the foundation stone. By 1905 a newly acquired property in Hendon was already in use as the repository for the Library's newspaper collections. I shall always think very gratefully of Sir Edward for providing a facility in which I have spent so many useful, entertaining and, I hope, productive hours! During this same period there were long and controversial exchanges over the administration of the Natural History Museum, which had been moved to South Kensington in the 1880s, while still remaining under the control of the British Museum Trustees. This heavy load of administrative activity taxed Thompson's strength; he was nearing seventy, and in the winter of 1908-9 his health was seriously affected. He retired in August 1909, after 48 years of service. He was awarded the order of Knight Grand Cross of the Order of the Bath, one of the highest civil honours the king, with whom he had worked long and amicably in the service of the Museum, could bestow. He recovered his health to some extent, and continued his scholarly activities for nearly another 20 years. Of Sir Edward's personal and family life little is said. His wife, who found life in London impossible, as she was asthmatic, died in 1917. His only daughter took care of him for the rest of his life. He had three sons, one of whom, Major G Maunde Thompson, was the chief mourner at the funeral at Brookwood cemetery in September 1929. His last years were spent at Mayfield in Sussex, where he was a valued supporter of St. Dunstan's church, and of the local Conservative Club. One of his colleagues, Sir George Warner, describes his enthusiasm for walking over the Sussex downs; he also portrays him as the 'strikingly handsome man, with fine features, dark hair, and light blue eyes, and an erect carriage' who can still be seen in the portrait which hangs in the board room of the Museum today. Louis Lindo claimed that Sir Edward had no wish to maintain any contact with Jamaica, unlike his brother, who returned here to live, and his uncle, Sir James Poole, who revisited his birthplace in 1897. How true this claim is, we can hardly know, although there seems no reference to his visiting Jamaica after the 1860s. Whatever his feelings about Jamaica may have been, they can hardly detract from his impressive record at the British Museum. It was a matter of great interest to discover that this great institution, which was founded largely on the collections of Sir Hans Sloane, which he had started when he was in Jamaica in the 1680s, owed so much to another man, with even stronger Jamaican roots. I hope that it may be possible to find out more about Sir Edward Thompson's family and Jamaican connections, going back to the 17th and 18th centuries, and also in contemporary England and Jamaica.